With the ever increasing price of utility power, and the ever lowering cost of solar equipment, on-grid solar continues to grow in demand. At Greenwired we understand that navigating the different types of products, financing, and installation methods can be challenging and confusing to home and business owners. Fortunately for you, it doesn't have to be confusing! Our knowledgeable staff will handle every step of the process; from design and installation to system sign-off and interconnection, Greenwired will take you on the road to solar efficiency and success. With over 30 years of experience living and working with solar electricity, making power from the sun is no new thing for us. From small super efficient homes to large commercial locations and healthcare facilities, we have a portfolio of experience and an ever increasing list of very happy clients. Ready to join the Solar Revolution? Check out our Grid Tied Calculator to get an estimate of the cost, and find out how much you could be saving on your monthly power bill! How does Grid-Tied Solar work? Grid tied solar panel systems work in concert with established utility “power” lines. These systems work well when you have the convenience of utility grid power but want to tap the renewable energy sources around you. 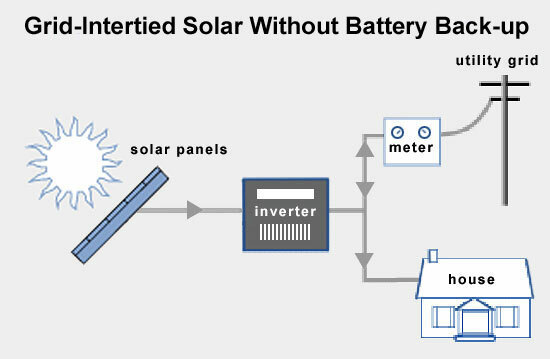 Simple grid tied systems require no costly batteries for storage and can be installed easily, making power from the sun a simple economic and ecological investment. Some people think that you need to change wiring or appliances in your house to work with solar. This is not true. All you need to do is place an array of panels on your roof or somewhere in the sun and add an inverter that will allow it to interface with the utility grid. These systems interface with the utility grid, either supplying power to your home if you need it or pushing your meter backwards so you can use it later. Saving money while saving the planet by producing your own power sounds like a win, win. But what if the power goes out at night, or during a storm? By adding batteries to your grid tied solar system we can power your home without the grid. This way when the power goes out we still have power. There is added cost and complexity to integrating batteries to a grid tied system but it allows system owners the confidence to know that whatever happens they will still be able to keep the lights on with or without the utility grid by using the sun's energy. 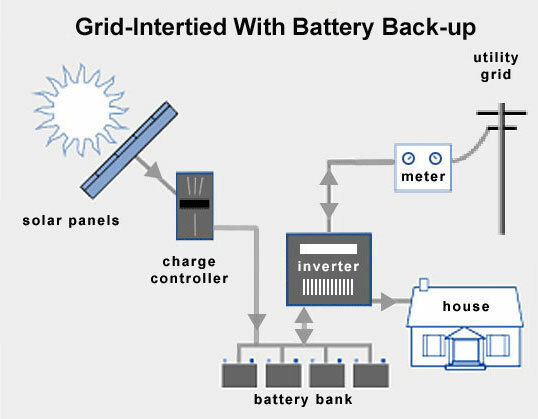 If you already have a grid tied solar system and want to add battery back up to be prepared for the next power outage? No problem. By working with your grid tied system we can add a battery bank by just adding batteries and a battery based inverter. Of course, there are a number of things to consider when doing this so let Greenwired help you design the system that will light up your home in the dark. 1- Choose which "loads" you want to run when the utility goes down. Be selective and choose only the things you will need during the power outage. Most often outages happen during storms, when there is little solar power coming in to the system, so we will need to rely on limited battery storage. Lets not waste it on things that we don't need! Power for the heating system: (fans, pumps, and controls) to keep the heat on. General lighting: Choose a few lights in house that will keep the light on through the storm. Refrigeration: keep the fridge and freezer on to keep your food fresh. A few general power outlets: For charging cell phones, keeping radios or TVs on (for public safety announcements), and other emergency appliances. Security Systems: Keep your home and family safe when the power goes down. 3- Chose a battery based inverter that can handle the capacity of your solar system as well as the loads that you plan on running on it. Hire a licensed electrician to set up a critical loads panel and connect the AC coupled inverter system to your home. Enjoy the confidence of knowing you have power when the grid fails. Check out our online Grid Tied Calculator to get an estimate, and see how much you could be saving on your monthly power bill! You'll pay the upfront cost of your system, but then pay $0 for the electricity produced from your system, saving money every month. You also get the 30% federal tax credit applied to your income taxes (available through 2019, after which the tax credit will drop). Return on investment (ROI) for a system calculated at 25 years can range from 8 to 12% (ROI varies depending on customer). By partnering with a financial institution (yours or one recommended by Greenwired) you can borrow the full cost of the solar system at a rate between 3 to 6%. You still get the 30% federal tax credit applied to your income taxes (available through 2019, after which the tax credit will drop), and you receive a return on investment (ROI) for a system calculated at 25 years, that can range from 8 to 12% (ROI varies depending on customer). Greenwired is proud to partner with Ygrene Works, offering no money down, 100% PACE financing for your solar system.